I ventured out of the Midwest to visit somewhere I had never been before… Oregon! I left Minneapolis in desperate need of a break and came back ready to get back to work. It was a good breather from all the things I’ve been doing for the shop this summer, getting ready for my big fall launch that starts next week (Yay)! While I was on vacation, we finished raising money for the Crohn’s and Colitis Foundation through the sales of Nearly Perfect Pins. When Luke and I got home, we donated $1,040! It was a pretty great feeling. Thanks to all who purchased pins and/or made a donation! I am about 60% hopeful, 40% fearful about the coming season. Business has been slow since May and I haven’t been growing like I was last fall and spring. After chatting with other online small business owners, I’m assured that this is totally normal. But, since things have been slow for about four months, it’s been easy for me to convince myself that I’m actually stuck here. I don’t really think I am deep down, but what if ?? Only God really knows what’s ahead but, I’m hoping for the best. I recently chatted with a friend who introduced me to the writings of Wendell Berry. He often compares life to farming – that there are seasons of harvest and seasons of sowing. I know this truth is all over Scripture, so I also found comfort in similar Bible verses as well. I’ve planted my seeds, tended my crops, and I’m ready for the harvest. Want to get weekly notifications during my big fall launch?? Join my mailing list! Fall launch starts Sept. 4th and ends Sept. 21st! I’ll be releasing prints, pins, mugs, calendars, notepads, and more! I’d love to share with you what I’ve been working on all summer! Early bird pre-order ends September 19! I’ve been waiting a long time for this day. The day I get to reveal the cover of my second book and open pre-orders! I wrote about this in the intro of Ephesians: A Hand Lettered Devotional and I’ll mention it here: I genuinely didn’t think I would be doing another book like this or even self-publishing again, but here we are! Another book and publishing on my own once again! My new book will be very similar to my first book, Romans: A Hand Lettered Devotional. I created intricate handwritten art for each chapter and wrote devotional thoughts, sharing what I learned as I studied each chapter. The book of Ephesians in the Bible has six chapters, so instead of doing one page of art for each chapter, like I did in my Romans devotional, I split each chapter in half (with the exception of chapter six), meaning 11 pages of art and 11 pages of devotional content to accompany each half-chapter. 22 pages didn’t quite make for a long enough book, so I also included a lot more information on my creative process, how to start Bible lettering on your own, and even some fun alphabets, tips, and tricks to inspire you and help you get started! This was something I wished I would have been able to do in my last book, so I’m thankful the Lord gave me the opportunity to include this content in my new, 40-page book! Last year, I launched a Kickstarter campaign to help cover the self-publishing costs for my first book. 74 people pre-ordered Romans: A Hand Lettered Devotional through that campaign, raising $3.6k, which covered the book’s first print run, ordering shipping materials, and some marketing costs. That pre-order campaign was very successful, but when it came to finally shipping the books out, it was much more complicated and expensive than I expected. So, instead of launching another Kickstarter pre-order for Ephesians: A Hand Lettered Devotional, I decided to launch the pre-order right where I’ll be selling the book when it’s officially released: at my Etsy shop! This will make the shipping process much easier and less expensive so the money can go towards more fun things, like printing more books and getting the word out about this new book I put so much of my heart into! Order today to get the best deal I’ll be offering on my new book, Ephesians: A Hand Lettered Devotional. Thanks for helping me finish this project! I can’t wait for you all to see it when it’s officially released November 2018! How do you manage stress and anxiety during the workday​? I recently posted the photo below on my Instagram stories, sharing about my brief walk to help manage my anxiety. I asked the question: How do you manage stress and anxiety during the workday? And I loved the responses you sent in! I’ve also mentioned in recent blog posts that I’ve been struggling with anxiety, so I decided it would be fitting to share the great advice so many of you sent in right here on the blog, instead of on a quick Instagram story that will disappear in 24 hours. This will not only allow me to spend a little more time reflecting on your words of wisdom, but it will also give others the opportunity to stumble upon these words on a later date. How do you manage stress and anxiety during the workday? I want to make sure I mention that I am not trying to say one or all of these answers will cure an anxious heart. I have had seasons where I’ve gone to counseling and been on medication, so I am sensitive to those of you reading this who might think, “Easy for her to say!” or “She really doesn’t get it!” I know personally that overcoming anxiety is not a quick fix. These are just a few answers I felt either personally connected to or thought others might find beneficial to help combat anxiety in the moment. Advice to help you and me simply get through the day. Also in the evenings: Knitting, Netflix, Harry Potter… my interests that aren’t related to work! Take good care of yourselves! Do what is best for YOU to get through the day. If you’re struggling with deeper anxiety, I highly suggest getting help, whether that be through friends and family, counseling, your church, medication, or a combination of those. You are not alone! Thanks again for all the great responses to this question! Can’t wait to try some of them myself! I feel so conflicted at the moment. The online shop owner in me could not be more THRILLED that July is over, but the chilly Minnesota girl that I am is having mixed feelings about it being August. Fall is right around the corner and it’s my favorite time of year. However, it’s always an inner battle for me because I love being able to walk outside in shorts, sandals, and no coat, which happens only 3/4 of the year. But for some reason, there is something about fall that is so magical to me that even the warm summer temps can’t compete with it. Anyone else having these feelings with me? One of my goals for July was to feel really good about all the progress I made on my new book (Ephesians: A Hand Lettered Devotional) when the month ended. I got a lot checked off the book to-do list, but my most rewarding accomplishment was finalizing the cover art. That’s arguably the hardest part of the whole process, in my opinion! What’s left? Not a whole lot! I need to have all the content sent to the printer by no later than mid-September and I very well could be sending it all in at the end of August! Yay to being ahead of schedule! Early bird pre-order will most likely start the last week of August, so join my mailing list to be the first get info on all the deals and freebies that will be included for those who order early to help me cover some of the manufacturing costs. I did this through Kickstarter last year, but have just decided to do it through my shop this year because it makes managing orders way easier! I ordered and received my third print run of Romans: A Hand Lettered Devotional from my new printer who did a fabulous job! I think I have plenty in stock now for the busy fall/holiday season, but if I start running low again, no big deal, because my printer is now local, which makes reprinting so much easier! Together, we raised another $170 for the Crohn’s and Colitis Foundation through Nearly Perfect Pins sales. That puts us at just over $700 raised! It’s our goal (mine and my husband’s) to raise $1,000 before December! Read about why here and order your Nearly Perfect Pins here to help us reach our goal! God is faithful. This is ALWAYS a win, but I really clung to that truth through the ups and downs and everything I learned this month. Sales were so. Stinkin. Slow. I know this is the norm for online shop owners in the summer, but wow. I’m thankful to say I was prepared, but that doesn’t make it any more fun. My anxiety levels have spiked. I’ve been very busy finishing my book and designing new products for fall/holiday launch, which has been so exciting, but when you’re putting in the hours in and not seeing a whole lot of financial payoff, it’s stressful – especially since I have to have all my products ordered by mid-August, which is expensive! So, I guess, to make it a short statement: There’s a lot of $$ going out, but not a lot coming in, so money is stressing me out! BUT (I can’t leave this on a negative note), I know things are about to turn around with fall around the corner, I prepared as well as I could have, and God has been faithful to provide. Going off that last bullet point, I’m learning to put things into perspective. I started planning for fourth quarter and based on my sales last year and how much I’ve grown this year, I’m very hopeful for the near future! When I think about how far I’ve come and where I have the potential to go in just the next couple months, it makes these slow months seem like less of a big deal and having that perspective has calmed me down in the moments I feel my stress and anxiety taking over. I don’t want to end on a stressful and anxious note, so I’m going to close with a message to my other shop owners and aspiring ones: You’re not alone! Summer is rough for everyone! Keep working hard, use this slow time to prepare for the busy season ahead. And whether or not you have a relationship with Christ, I encourage you to seek Him in your highs and lows and your own wins and learns. I cannot imagine walking this path and living life without Him. He has sustained me time and time again and He promises the same to you. P.S. Want to be featured in a future blog post? Have one of my pins? Email me a photo (or multiple photos!) 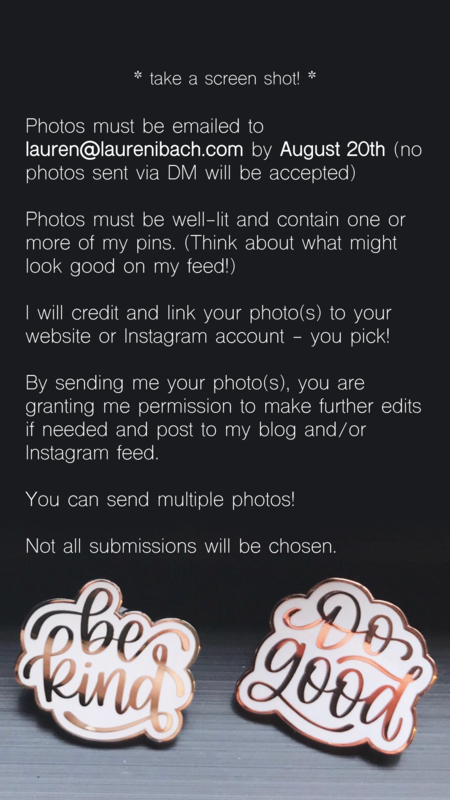 of how you wear and/or display your pins for a chance to be featured here on the blog and my social media pages! Click here for more details and here to send me an email! The deadline to submit photos is August 20th, so send them my way whenever you get a chance this month! (Don’t have one of my pins yet? Click here to browse and shop!